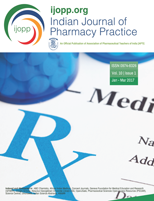 All articles published in Indian Journal of Pharmacy Practice are made open access immediately. Authors: Pelluri R, Prasad TS, Madhuri C, Supriya K, Mukharjee KS, S.Y.G.Prasad, et al. Authors: Sri NG, P. Navya, Nagalakshmi V, Vasudha G, Roa VJ, Swethanjali K, et al.